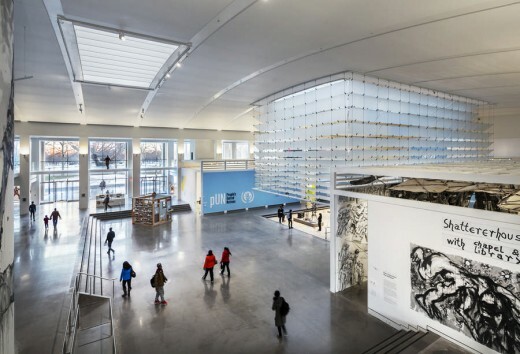 March 2014 – The first phase of the newly expanded Queens Museum designed by Grimshaw is now complete, signaling a new era for the historic New York City building and the surrounding community. 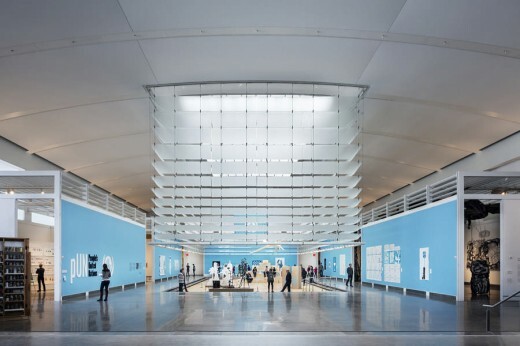 Located in Flushing Meadows, Corona Park, Queens, the Museum has now doubled in size to 105,000 square feet. Grimshaw won the project in 2005 through the Design and Construction Excellence program administered by the New York City Department of Design and Construction. The opening marks the completion of the first part of a two-phase expansion. 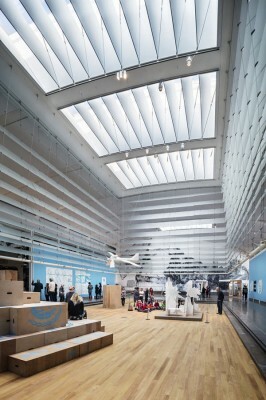 Working towards a completion date of 2015 for phase two, the Museum will also house a new branch of the Queens Library. Now visible from the adjacent Grand Central Parkway, a multimedia façade and entry plaza invites visitors to the site while serving as a gateway to the park. This new west façade is distinguished by a sculptural, metal, entry canopy and a series of glass panels spanning the length of the building. 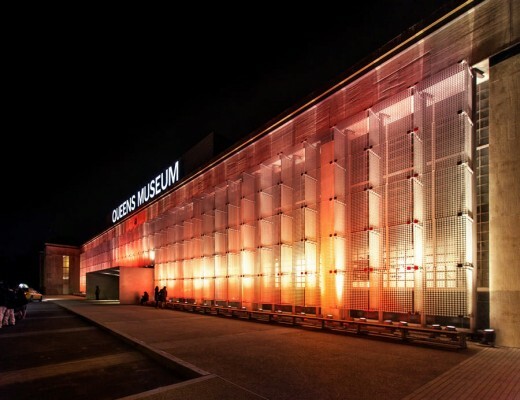 Backlit by programmable LED lighting, the west façade not only serves as a beacon for the Museum, but also as a dynamic new canvas for commissioned works of art. 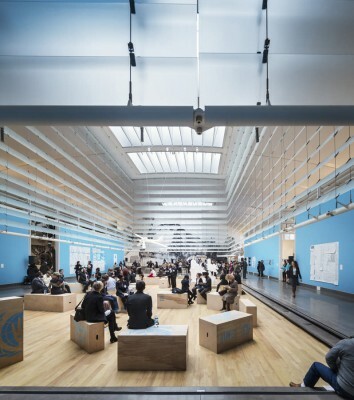 Several skylights allow natural light to filter inside the museum through a hanging glass lantern, diffusing natural daylight to the central large works gallery and surrounding temporary exhibition spaces. 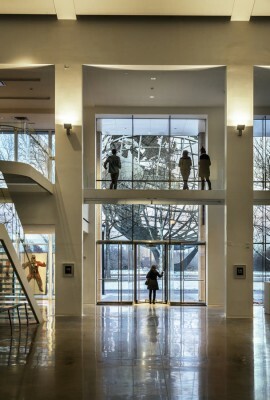 A fluid glass staircase responds to the existing geometry of the panorama, the 1964 model of New York City, and invites visitors to the second floor where gathering spaces overlook both the park and galleries. 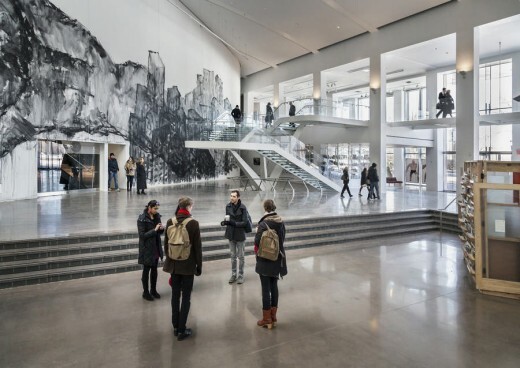 Known for its educational outreach and community engagement, the new Queens Museum expansion comprises several new classrooms and support spaces, further positioning the Museum as a cultural venue where the world of art and community can engage in open, meaningful dialogue.